As World Vets team pulled up to the local school, which was to be our clinic site, piglets and chickens were busy foraging on the school grounds. Unafraid of our presence they continued about their daily routine. As we proceeded to set up our work stations we were greeted by a donkey that happened to preside over a family’s small agricultural plot next door. He provided constant reminders of his presence, “hee – haw”, that enticed many of us to go see him throughout the work day. 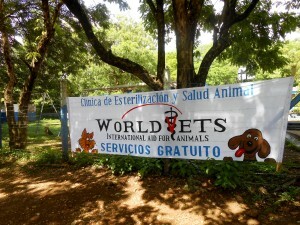 Until recently World Vets had not set up a direct veterinary service campaign in this particular community. Located 25 minutes or so outside of the main town of San Juan del Sur, the rural community of Escamequita is a world of its own. In contrast to town, houses are scattered over considerable distances and made from all kinds of materials; from wood to metal scrap and/or brick. All animals, including dogs, pigs, chickens and turkeys roam free, yet everyone knows which house they belong to. 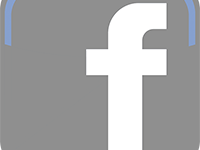 Furthermore, potable water may only be accessible from a well and during the rainy season the only road to and from Escamequita may be washed out, limiting contact with town and its subsequent products and services. 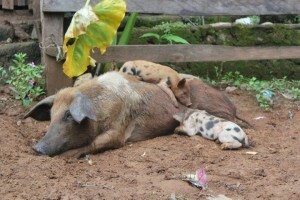 Even though World Vets had never visited the area before, the animals of Escamequita have quite a history with World Vets and the services we have provided in San Juan del Sur over the years. This has much to do with concerned and kind hearted expatriates who also live in the area. Without hesitation, they have rallied local households and loaded up their trucks with animals, accompanied by their owners, to receive our services, wherever they would be provided. The animals brought to us in their vehicles were always the ones that had the worse body conditions and needed the most TLC from our teams. After years of their dedication and demand for veterinary care, it made perfect sense to bring our services directly to them. 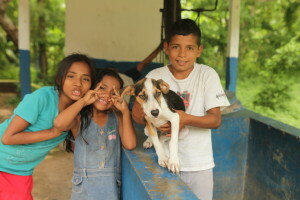 Our recent campaign in Escamequita has acted to harness this growing awareness of animal welfare and responsible pet ownership, especially amongst the young population. 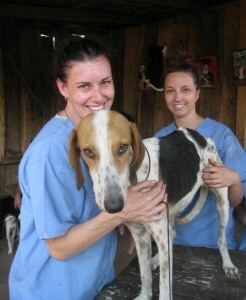 Many animals from the original “truck loads” were first brought to us to receive spay/neuter surgery. Now we happily welcome them back for follow up medical treatments. And wouldn’t you know it; they were some of the healthiest looking bunch during our recent campaign! Our visit to Escamequita has also served to further promote the concept of animal wellness, specifically for new pet owners who had not previously sought out our services either due to distance and/or logistics. In consultations we saw one young boy who brought his puppy for a check up and to receive preventative health treatments. This is the first step we explained, to being a responsible pet owner, and his father proudly agreed. 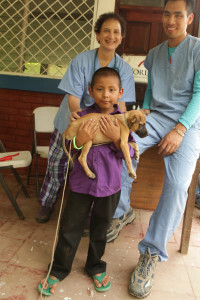 More than anything our veterinary services in rural communities such as Escamequita provide the means for individuals to care for and be responsible pet owners. 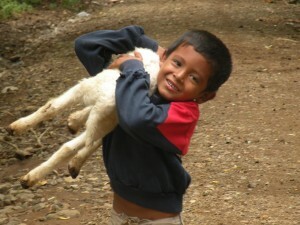 It is a huge misconception that people in foreign countries simply do not care for their animals. They do! This young boy is but one example. 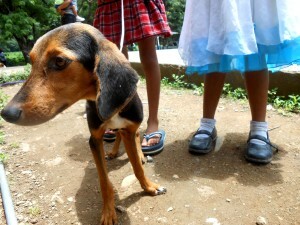 World Vets has a team in San Juan del Sur, Nicaragua this week. They are operating various veterinary campaigns. These campaigns are meant to address and target the disadvantaged animals residing in the rural outlying communities. So far this week, our team has executed a door to door service providing de-worming and parasite treatments along with health consultations for campesino dogs. They are also operating a field condition spay/neuter clinic that is accessible to our target communities. And finally, they are getting down and dirty providing veterinary treatments to livestock and horses. All World Vets services are provided at no cost. 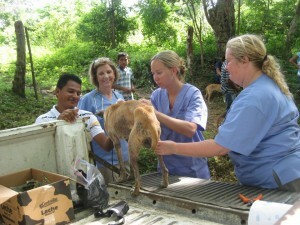 Next month World Vets will send a team to work in a rural community outside of San Juan del Sur, Nicaragua. Up until this point, our veterinary services have mainly been focused in and around the beach town to help control the small animal population. However, with this visit, we wish to extend our reach to the animals, both small and large, that have often been neglected due to their isolated condition. In the community where our team will be working, running water and electricity are not present even despite the rapid growth and devel opment of the town closest to them. Nevertheless, due to the vigilance of community leaders and special interest groups, plans have now been approved to give them electricity, hopefully sometime soon. World Vets first visited this community last year to provide impromptu veterinary services – they expected a few cows, maybe a couple of horses and some pigs – however the turn out was extremely great. Herds of cattle came down from the hillside, even oxen carts ap peared as well as a backyard full of pigs! 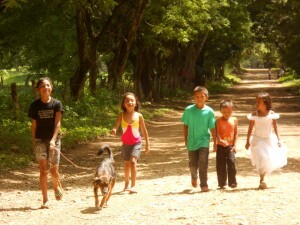 Given the abundance of animals, including campesino dogs with many visible health concerns, we gave our word that we would be back.